At least Dereck Chisora (15-2, 9 KO’s)emphatically signed his death warrant. By slapping Vitali Klitschko (43-2, 40 KO’s)in the face during their “stare down”, Chisora all but guaranteed he will be KO’d. Chisora has made repeated claims of how he is going to knock out Vitali in their bout scheduled for tomorrow (Feb 18, Epix & EpixHD.com). Yet a much more accomplished fighter (and better power puncher) in Lennox Lewis all but hit him in the face with a sledgehammer and Vitali didn’t even get shaken. Chisora doesn’t have nearly enough experience, size, or punching power to do the damage necessary. Vitali will throw that thunderous jab and wait until Chisora opens himself up, allowing Vitali to exploit that opening and turn it into a barrage of unyielding power punches. Vitali Klitschko by 5th round TKO. The upcoming boxing schedule just got a huge shot in the arm as HBO announced Yuriorkis Gamboa (21-0, 16 KO’s) vs. Brandon Rios (29-0-1, 22 KO’s) for April 14. I should have listed this fight on my Fight Fights Wishlist post, just a gross oversight on my part. Who doesn’t love a good brawl? This fight has K-O written all over it. Gamboa is jumping two weight classes to take on Rios at 135 lbs. It’s going to be a war, in my opinion. Both fighters are all action. Gamboa probably has the fastest hands in the sport and Rios is a grade A banger. Clearly HBO Sports has already improved upon last years (mostly) dreadful scheduling with new president Ken Hershman now at the helm. 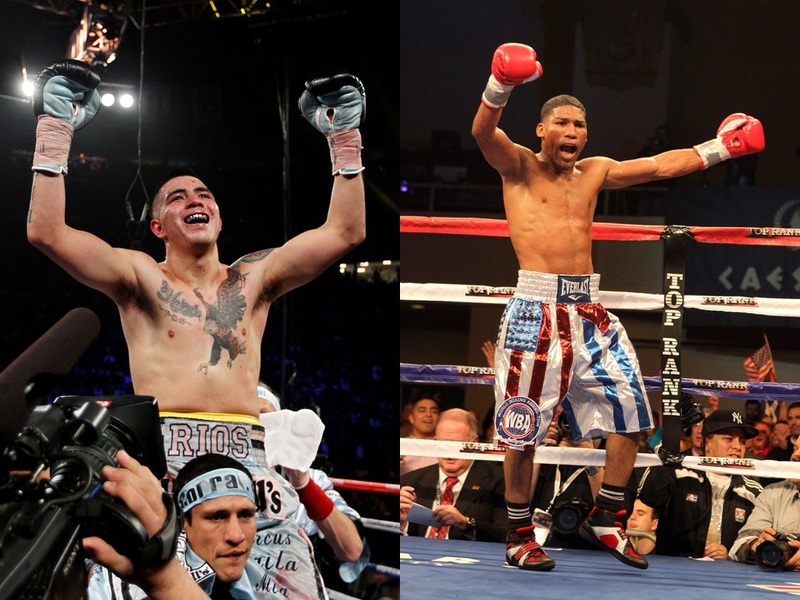 The scheduling of Gamboa-Rios is a masterful paring of young, in-their-prime fighters. Forget about that blown-up Alexander-Bradley disaster of a fight and think more along the lines of Gatti-Ward. I realize those are some lofty expectations, but I think if this fight can comprise of 60% of the action from those fights it will be deemed a roaring success. You have to love the job NBC Sports Network is doing with their second card in the “Fight Night” series, scheduled for March 24 in Brooklyn, NY. To bring in casual fans you need at least some name recognition on the card. Considering the card is taking place in Brooklyn, and that Zab “Super” Judah (41-7, 28 KO’s) hails from there (and in his 16-year-career has never once fought in his hometown), it’s a no-brainer for the main event. The man he is facing, Vernon Paris, has an undefeated record (26-0, 15 KO’s), but has faced no one of consequence. The hope here is that with the fight being a title eliminator (for the 140 lbs title) and the winner getting a change to face the winner of Lamont Peterson-Amir Khan there’s enough incentive for the fighters to put on a spirited fight with a shot at the title on the line. On the undercard is former heavyweight titlist Sergei Liakhovich (25-4, 16 KO’s) taking on unheralded Bryant Jennings (12-0, 5 KO’s) out of Philly. Also, Tomasz Adamek will be appearing on the card against an opponent TBA. Paul Williams (40-2, 27 KO’s) is claiming that he is the underdog in his fight tomorrow (Feb 18) against Nobuhiro Ishida (24-6-2, 9 KO’s) who is best known for his first round destruction of James Kirkland in April 2011. That’s a ludicrous thought and an obvious attempt by Williams to try and give himself a mental edge by imagining he is the underdog. In no way, shape or form is Williams the underdog, even given his last 3-4 not-so-hot outings. I mean Ishida’s last fight was against a guy making his debut professionally. All that being said, if Williams loses this fight he should 100% retire. My reasoning being his last three fights have been (in order) a fight against Kermit Cintron where it appeared that Cintron literally jumped from the ring overshadowing the fact that Williams wasn’t having his best day, Sergio Martinez utterly destroying him in the second round with one of the best one-punch KO’s you’ll ever see in your life, and a majority decision win against Erislandy Lara which was one of the worst judged fights you’ll ever see in your life. A fight in which Lara clearly won a close to unanimous decision. I even scored the fight 117-111 for Lara. It was a travesty. Point being, if he throws a loss or even a win in which he looks bad on top of those last three clunkers then it’s time to find another profession.